Last weekend, I was extolling the benefits of regular exfoliation to a friend who claims never to have tried. Cue very puzzled, botox-free expression on my part. I believe exfoliating to be anti-aging, helping to maintain clear pores, remove dulling dead skin cells, reduce pigmentation and, if all of the above aren't enough to convince you, exfoliating allows your lotions & potions to be better absorbed into the skin, thereby saving you money! Said friend claims to put aside a Sunday night to indulge in a leisurely soak in the bath, cleanse & tone and a once weekly application of night cream. If she weren't so laid back, I'd be inclined not to believe her- she has great skin. However, I'll still be recommending she adds this kit to her Sunday Spa Night. I was fascinated when I was sent the Skin Sparkle kit from Vie at Home which contains two tubes for a two-step home polish. The silver and white packaging looks clinical and gives no hint as to its bargain price at just £15.50 for the set. The two tubes are Crystal Polish, rich in vitamin C and designed to remove the dulling dead skin cells and Energising Serum with salicylic acid. 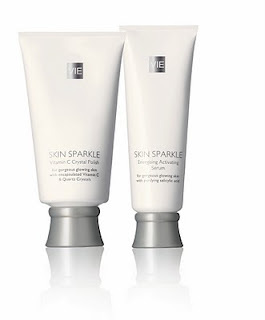 Don't be put off by the "Sparkle" name- this merely refers to the thorough exfoliation, not any glittery particles. You may be familiar with Vie from the days when it was part of Richard Branson's Virgin empire. They've since parted company yet Vie lives on. It's never one of the first beauty companies I think of but I have to say, this trial has left me highly impressed and it proves that you shouldn't dismiss a product based on preconceptions of branding. The on-pack instructions are clear and easy to follow. Step 1: Massage the Crystal Polish onto clean, dry skin for one minute. Do not rinse. Step 2: Massage a generous amount of gel on top of the polish. Rinse thoroughly after 2-3 minutes, pat skin dry and follow with moisturiser. Crystal Polish is a thick balm style formula with very small grains suspended within it. In fact, it's so thick that I found it a little difficult to squeeze out of the tube! It has an incredible scent which no doubt comes from the inclusion of Sweet Orange Peel Oil. I really liked how it melts into skin. It actually reminds me a little of a facial version of Elemental Herbology's wonderful Beach Prep, if you're familiar with that. The grains feel very gentle on the skin, I'd compare the granular texture to the product the hygenist uses when you have your teeth polished! You do need to use a fair amount to cover the face. It definitely seems odd to apply the serum directly on top, without rinsing. The serum is a rather liquidy gel which creates a foam when applied onto the skin & seems to be the more tech-y of the two products. The packaging said to expect a slight warming sensation, although it was hardly noticable. I wouldn't say it's any more difficult to rinse away than any other exfoliator. I'm impressed at how quick the treatment is to carry out and I liked the ritualistic aspect of using the two tubes. My skin was left feeling super soft, smooth and glowing and I can certainly see the benefits of the deeper, two-stage exfoliation. I really cannot find fault with this kit. I'd recommend it to anyone looking to recreate a salon facial experience at home.